Expect a Miracle: I Am So THANKFUL!!! 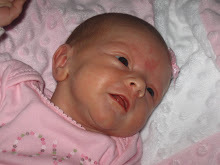 1-Ellie Maxine, our beautiful miracle baby, she has brought more joy than I ever knew was possible! 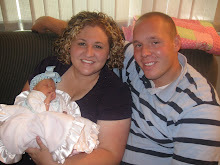 2-Rachel, our sweet birthmother and friend. LOTS OF LOVE!! 3-Jeremy, for bring such an amazing husband, and working so hard for our family, he is the love of my life and my best friend. 4-My mom, she really stepped in to help when we we only had days to get ready fo Ellie and I was in a panic! 5-My sisters, for coming over and cleaning my house, and watching Ellie so I can lay down! 6-Sara, for coming from Ohio to see our baby and making me the CUTEST diaper bag and quilt for Ellie! 7-Our sweet neighbors and ward members who took such good care of us when Ellie came. 10-Jeremy's job: you never realize how blessed you are until you have to go without it, 8 months of unemployment this year.... we are so GRATEFUL for our EMPLOYMENT!! 11-My sweet grandma BUB, losing her this year was one of the hardest times for me, but I am so grateful for her legacy and that my daughter can carry on her name. 13-My dog. Funny how attached infertile people get to their pets. Yes, I talk to her and she has been my baby for the past three years!! Hahahaha-- ok bring on the crazy pet lover comments! 15-The Christmas season that is finally here!!! Oh goodness, I have so much! 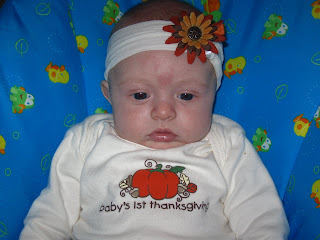 Up until Ellie came into our family, this year was going down in our books as the worst year ever, but it's amazing how a tiny baby can turn everything around! Ellie has been so fun, I love being her mom. I understand now when people say that being a mom is the hardest yet the best thing you can do, I love it! Ellie is starting to coo and grin whenever she looks at us, and everytime it makes my heart melt. Oh how I love my baby girl!!! yay, you are such a cute mommy! i am so glad things are getting better, and they will just continue to do so! happy thanksgiving, and don't worry about being a crazy dog lover, we still love you! How cute is Miss Ellie Maxine!!! 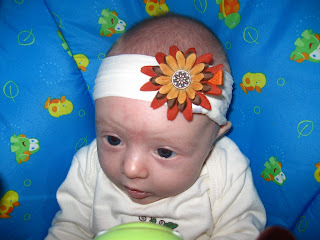 I love her head piece:) Hope to see you soon..
She just keeps getting cuter (is that possible?). What a great list you have. Mine would include some of yours--minus the dog lovin' ;0) We'll be down in UT for Christmas, so maybe we'll be able to stop by. Take care. Oh how beautiful I'm so happy for you guy's. I'm sitting here reading your blog just crying. I'm glad you have a blog maybe I'll keep in touch better. Sure love you guys and can't wait to see you in a couple weeks!!! Jenny she is so cute! Give her a great big kiss from us! Wow I come before the Husband huh?? I feel sooooo special!! Oh I love your blog. What fun pictures. We hope you have a wonderful Christmas.